Hi Everyone! Wow, it's 11:30 pm already! The day sort of went by quite quickly. I, initially, had plans to concentrate on a few projects but I lacked focus. I did manage to make this card. I randomly pulled the designer papers from my scrap pile and decided to see what I could come with. Initially, I wasn't feeling it. You know what I mean? It was like. . . "ick" but I decided to keep going. Suprisingly, I like what I ended up with. I think the prima flowers helped a lot. Getting tired of all the primas I've been using? Okay, after using the majority of the primas that I had bought a year ago, I decided that I was entitled to buy a new pack of Primas! LOL! Michaels is now selling Primas. . .really pretty ones too! I'm on a craft budget that my husband put me on but I recently sold a few old rubber stamps on Ebay. Okay. . .my husband had told me that I now have to start using my own money to buy my own craft stuff . . .there's a catch. . .I don't have a job! LOL! I understand why I need to be on a budget. Not really because I'm out of control. . .but more so because our expense this year has increased and I do have more craft stuff than I could possibly use. Believe me, I'm trying. I'm trying to be mindful about my purchases and actually use what I already have. I'm really getting better with my purchases. Anyway. . .nothing much to my card so I won't discuss much about it. Arggh. . .I think I'm going to go to bed. I'm sleepy already. Hi Everyone!! Happy Saturday to all of you!! Sometimes I wonder how long I'll be blogging. I'm still having fun with blogging but I wonder if there will be a time when I get tired of it and stop blogging. I even sometimes wonder if I'll still be making cards and such in a year or two. I guess it depends where I'll be in a year or two. I think if I return to work, I obviously won't be crafting and blogging much or like the way I am right now. My daughter is graduating from high school next year and I will definitely will be returning to work once she starts college. College is EXPENSIVE. I will try to make the most of my crafting and blogging before things change in my life. I have too much craft stuff so I really need to work on using them as much as possible. Anyway, do you somtimes get tired of crafting or blogging? Just wondering! I really like how this card turned out because I changed the orientation of the primary panel. It's different from my norm and I like the idea of doing something different. I think I'll make a few more cards with the panel in a different angle. Paper: Cardstock (not sure), Autumn Leaves designer paper (I think), K&CO designer paper. Hi Everyone! Just a simple card I made. I really loved the design of the paper so I decided to keep the card simple. I wanted the paper to stand out. I added the chipboard hearts to add a little something to the overall design but they were simple enough that they didn't take away from the design of the paper. Sometimes adding very little embellishments compliments a design that you want to focus on rather than take away from it. What do you think? I'm not sure what brand the paper came from. It was a scrap piece so I can't remember the brand. 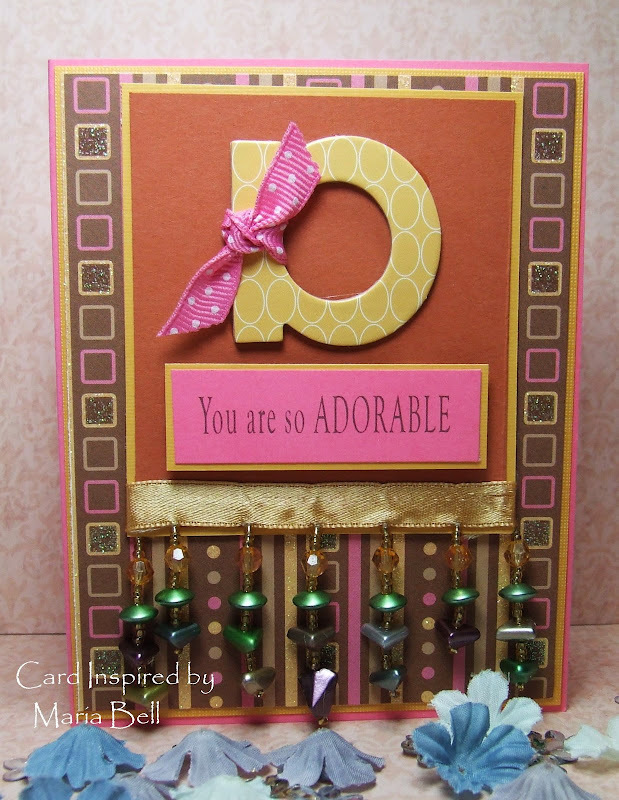 The chipboards are from Heidi Swapp and card base is an embossed cardstock by Die Cut with a View. 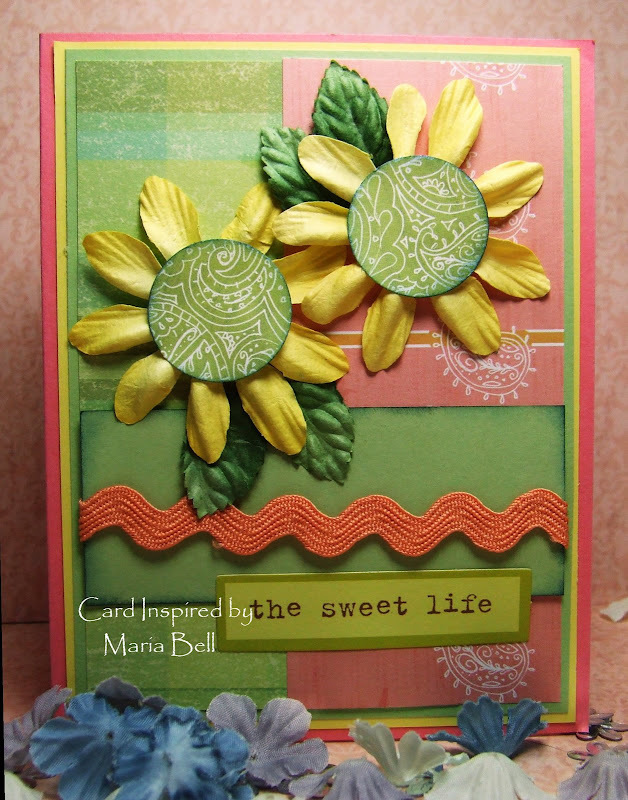 The scallop border was created using the Stampin Up Slit punch. 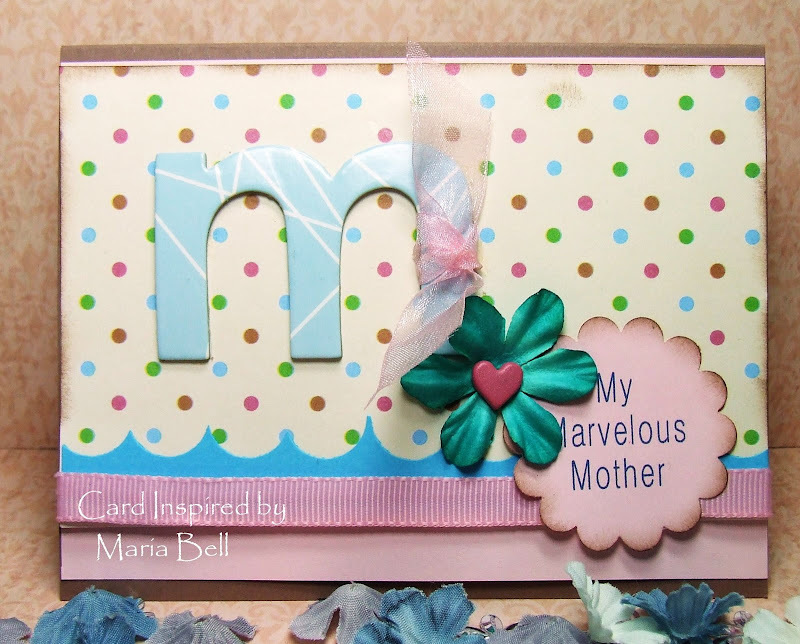 The majority of this card was made primarily with scrap pieces from my scrap pile. Here is another alpha card. The frilly beads hanging down are remnants from a box project I had created a long, long time ago. I had stuffed the hanging beads into my scrap ribbon jar and I decided to use it. It actually worked out nicely. Sometimes going through my scrap pile is sort of fun. It's fun creating something randomly and seeing what I end up with. Sometimes it's hard because I can't find stuff that match and it ends up sort of looking hodge-podgely put together. 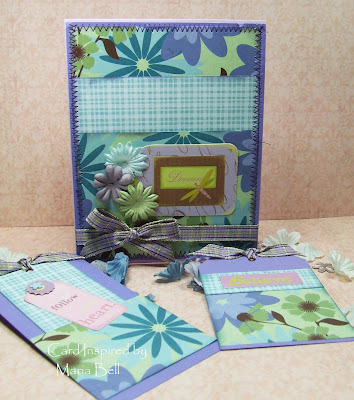 I see a lot of scrappy cards that look pretty hodge-podge but when I do it, it don't look as nice as those I see on other blogs. Anyway. . .I think this will be my last alpha card for a while. I have a lot of other stuff in my scrap pile that I need to use. Happy Wednesday, Everyone!! It's so funny because I thought yesterday was Wednesday. I only realized today that yesterday was Tuesday. LOL! 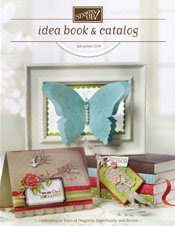 I was reading a few blogs and it seems a lot of stampers and crafters are starting their own stores and such. I think that is so cool!! I've thought of selling kits and such with instructions exclusive to the kits after I saw some ladies selling their kits directly on their blogs. My only reservation is that I love crafting and once I start turning it into a job, well. . .I may start to feel differently about it. Crafting is my escape after working. I remember when I was working (real job), my crafting helped me wind down and escape from the stress of the day. I looked forward to sitting down on my days off to create something. If I turn it into a business, well . . .where will I go to escape? I will have to look for another hobby. . . gardening perhaps? LOL! Anyway, I wanted to reserve today for crafting but I can't. . .I have a lot of chores and my garage still needs to be organized. I need to clean our wood floor. . .it's that time again. I clean my floor twice a month and I mean. . .CLEAN. The full polish treatment! Argghh! I hate doing it but it needs to be done. Well. . .now to my card. I made it last night before I went to bed. It's just a random card. I have a ton of chipboard alphas so I grabbed one of them and looked around for a "sentiment" that would match my alpha. It's sort of fun to grab an alpha and create a card around that alphabet. Try it. . .it's a great way to get rid of your alpha chipboards! I've been tagged by Tizzie Right to Stamp! Go check out her lovely creations on her site!! I have played for a long time so I decided to do this tag. I won't be tagging anyone else but if you want to play, just post the tag on your site!! Hope y'all have a wonderful Wednesday!! Hi Everyone! 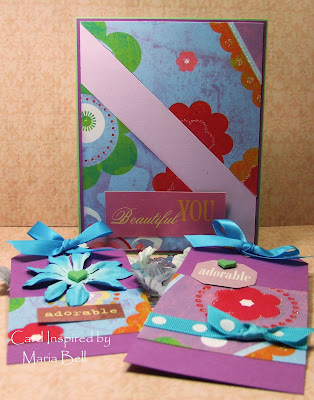 I created this tutorial in the attempt to use up my scrap designer paper. I'm trying to come up with creative ways to use up paper. I get bored doing the same things so I'm trying to brainstorm and come up with different projects. 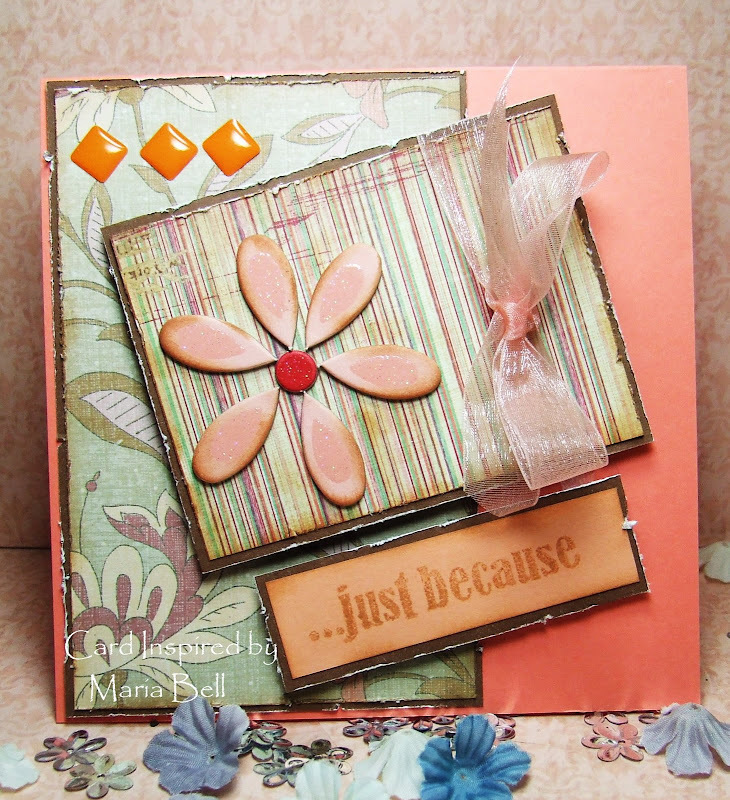 Anyway, I posted another sample on Stampin Inspirations if you want to check it out. This is a super easy double pocket card design. . .no fancy folds or anything like that. It's not even a real creative way of creating the pockets but hey, it works! LOL! I guess that's all that matters. Besides, I don't like complicated projects. Try it out and you'll see how easy it is to create it. Here are the tags removed from the pockets. 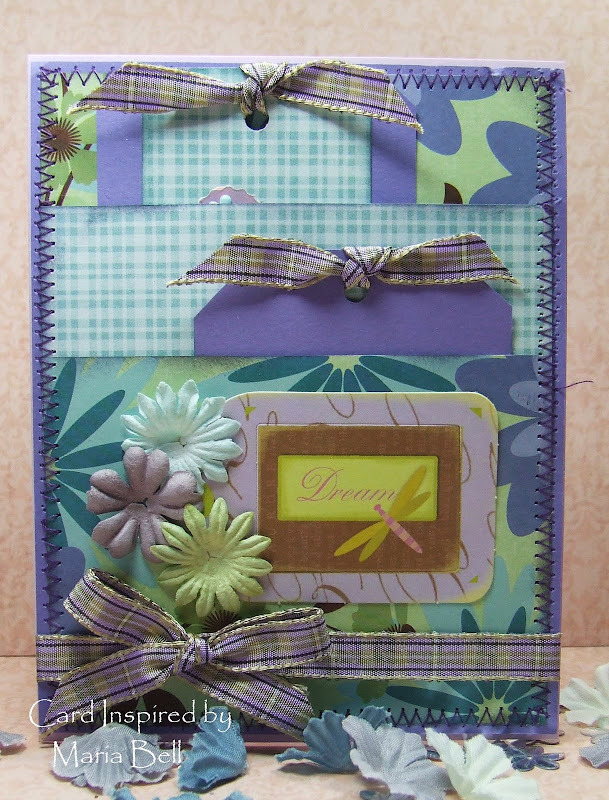 Here is another double pocket card but with a different design. I did a mini tutorial on my previous post if you want to try it out. Just scroll down. Again, just me finding creative ways to use my scrap designer paper. With this pocket card, the pockets are horizontal. Hi Everyone! Wow, I spent 2 days cleaning my craft room and I've come to the conclusion that I'm crazy! I have so much stuff that it's scary. I have a bad habit of buying stuff in "bulk" because it's cheaper to buy things in value packs. Unfortunately, buying things in bulk results in excess. I've made the decision to avoid buying in bulk or value packs. From now on, if I see something I like that is on sale, I'll buy only one of that item, not 5! LOL! Anyway, my craft room, despite 2 days of cleaning, really don't look nice and neat. It's a bit disappointing. I envy those craft rooms that I see on other people's blogs that look soooooooooo CLEAN. . .you know, with all those pretty jars and containers all neatly placed on the shelves. I probably could achieve that nice and neat look but that would mean I would have to get rid of 75% of my stuff! LOL! Instead my shelves look like I stuffed as much stuff that I could. . .oh, well. I made this double pocket card this morning. Again, using scrap designer pieces. 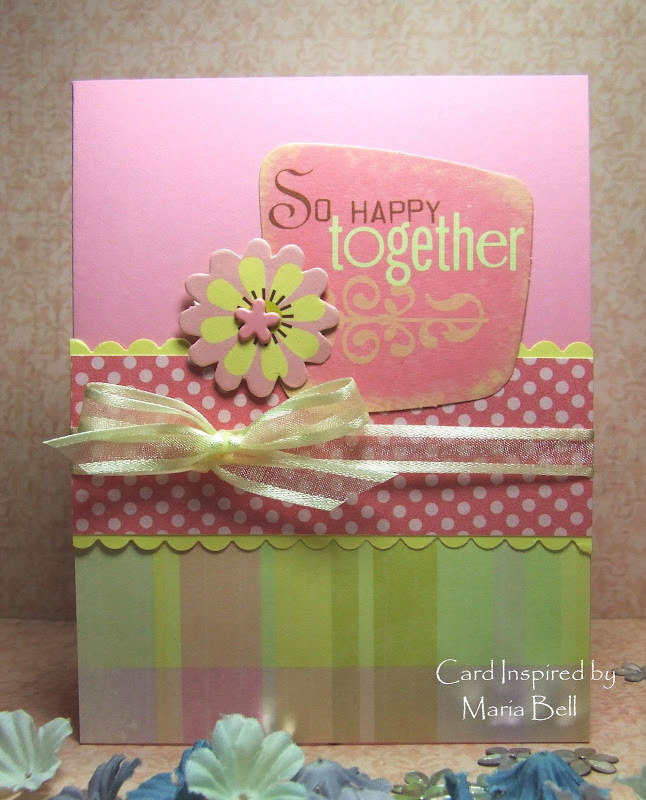 This double pocket card is a great way to rid of those smaller pieces of designer paper. 2. Apply adhesive to the 1/4" left and right edge of the second 3x4" designer paper. Adhere it over the first designer paper starting 1" down from the top. This will create the first top pocket. 3. Apply adhesive to the 1/4" on 3 edges of the third designer paper (left, right and bottom edge). Adhere to the bottom half of the 4x5.25" cardstock (matting) and over the second designer paper. When adhering to the matting, be sure the adhesive end is attached to the mat leaving the non-adhered end layered over the second designer paper. This will create the second slot or pocket. 4. Create your tags as desired. I'm sorry there's no photos. I didn't start off creating a tutorial but I figured you may want to know how I created the pockets with scrap designer papers. Hi Everyone. I'm spending the day cleaning my craft room. I'm really tired of looking at it! Arrgggh! I don't even want to step inside my room. I just feel so out of control whenever I walk into my room. Are you that way? Well, I am. Whenever I start getting messy. . .it's usually a reflection of the state I'm in so I decided to take control and clean my craft room. I love listening to alternative music and I love Christian alternative rock bands. We have a radio station that plays only "positive alternative music" and I love listening to great alternative bands with a positive message. I saw Switchfoot about two years ago in concert and they were great! Some categorize them as a "Christian alternative band". "Gone" by Switchfoot is such an AWESOME song. . .I really love the message to the song. Check out the video and tell me what you think? The video isn't Switchfoot's official music video. . .it's just someone who created a video for the song because Switchfoot never created a video for this song. Here are a few of their other official videos. All of the songs have such positive messages. . .listen to the lyrics, you'll understand what I mean. Okay. . .now back to cleaning!! Hi Everyone! I had created this pie box for my club site and decided to post it here. I included the template below. . .I'm sorry that it's not the best copy of the template but it's workable if you want to try it out. Click on the image and it will enlarge. It will look really large but when you print it, it will print appropriately on to a 8 1/2 x 11" cardstock. 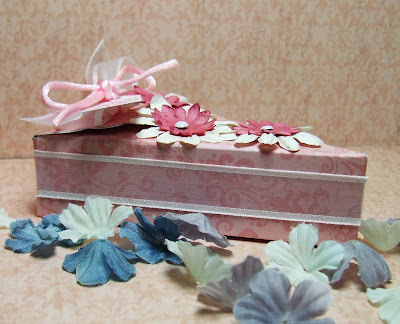 I decorated the box using CTMH Life Delights Level 2 Paper Kit and added the CTMH Autumn Daisy flowers. The "thanks" sentiment is from the CTMH "For Every Occasion" stamp set. It's a fun party favor, if you want to try it out! Hi Everyone! Once again, using up my scrap pieces. I do have a lot of scraps in my scrap pile. I'm slowly working through the pile and trying my best not to add to it. I'm now down to the smaller pieces. I think I'll be able to clear it by the end of the year! LOL! Honestly, it did look quite endless but if I stick to it and not cut up new designer papers, I think I can actually use them all. I have about 4 more large Prima left in the package. Yay! I think there was initially 25 in the package. The sentiment is from my sticker pile. I'm half way through the K&CO package of chipboard stickers so I'm being a good girl and "trying" not to open new packages of stickers and papers. 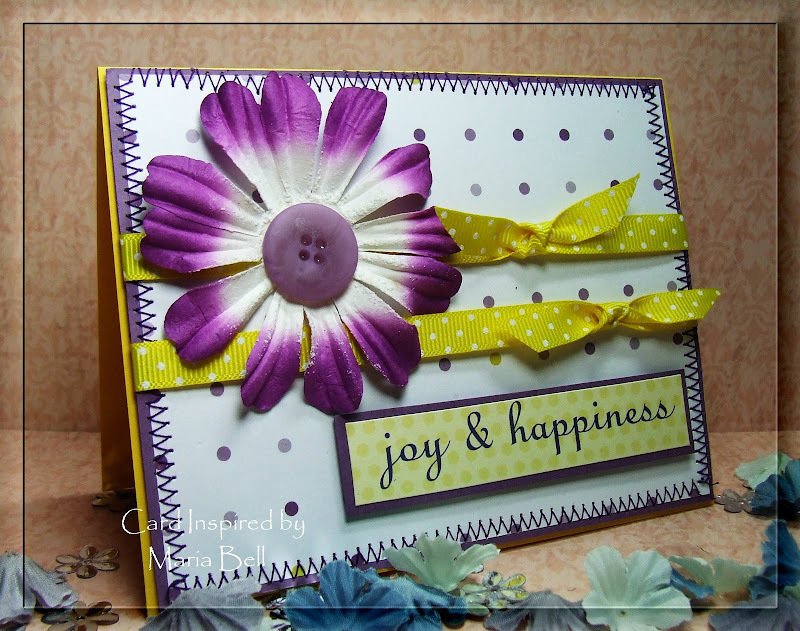 Here is another flower card I made. 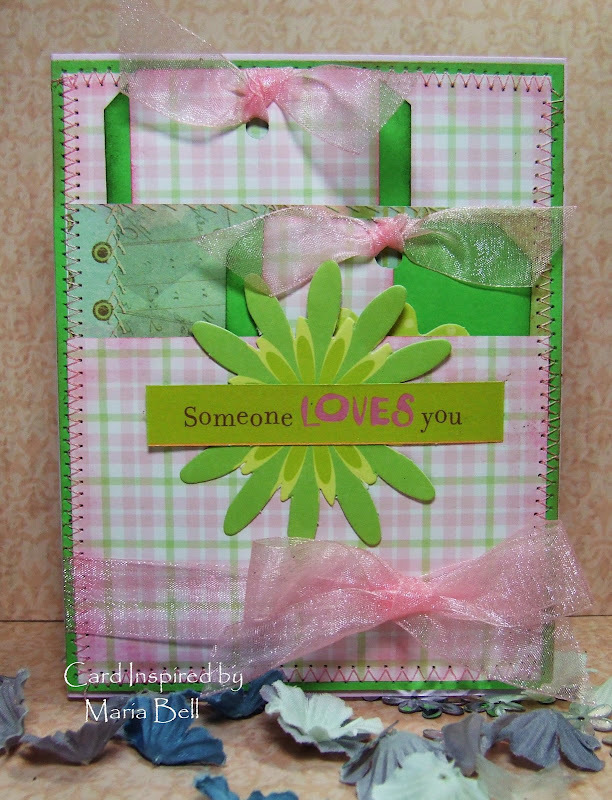 I discussed this flower card yesterday and if you scroll down to the previous post, you'll find the template. I made this card rather simple. 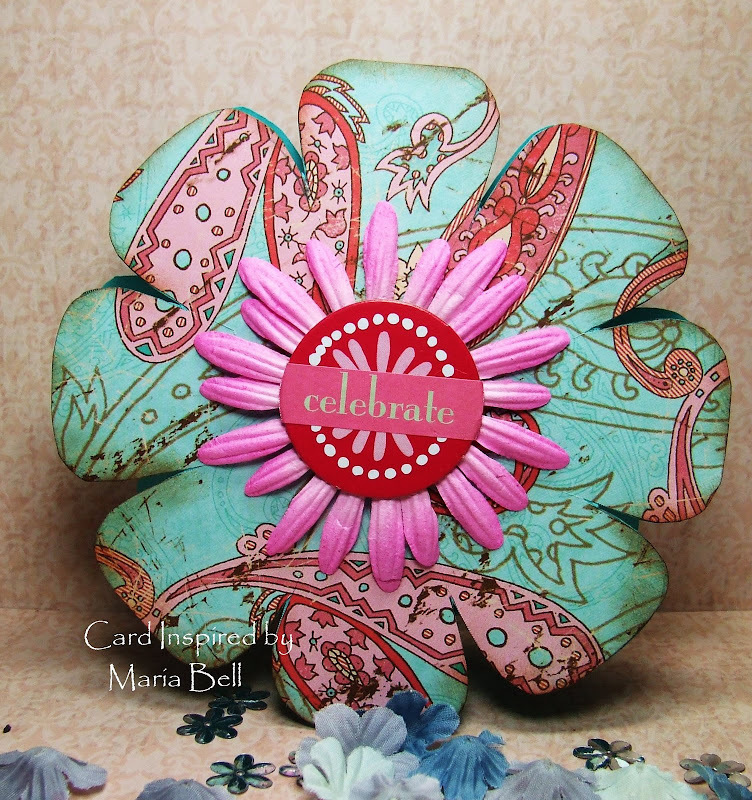 I took a chipboard flower sentiment by Colorbok, added dots using a gel pen and adhered it to a scallop circle using the Marvy Giga Punch. . .I believe the 3 inch scallop punch and added more dots. That's it. Anyway, I hope I'll have more time to craft today. I have a few projects that I need to work on. Hi Everyone! I had cut out a bunch of designer paper using the template above a few weeks ago using the template above with the intention of using them for a mini scrapbook album. I already created the album and I had a bunch of left over flowers so rather than using them for another mini album, I decided to create cards with them. Above is one of the cards I made. I have a few more that I need to create a card for so don't be surprised if you see more of this flower card on future posts. To create the card, I took a 12 x 6" cardstock and folded it in half. I traced the template on to the folded cardstock leaving the folded part of the cardstock intact. 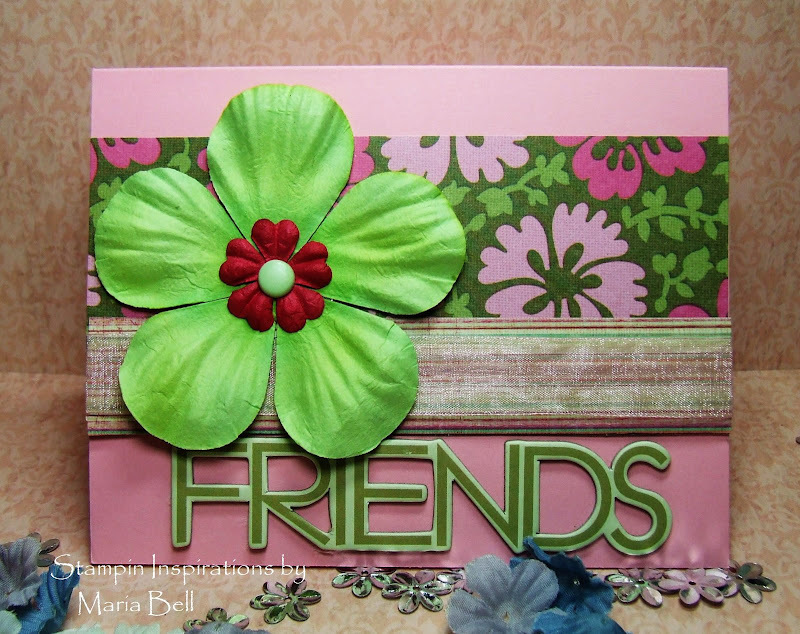 I took my flower shaped designer paper and adhered it on to the flower card base. That's basically it. 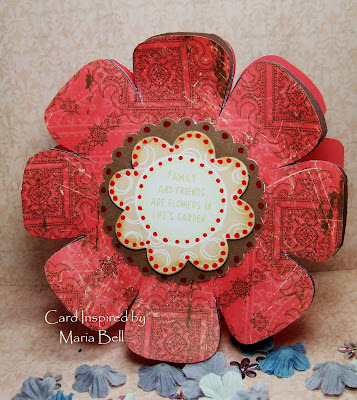 I decorated the card using a large prima flower by Deja View and attached a flower designed chipboard and sticker sentiment. 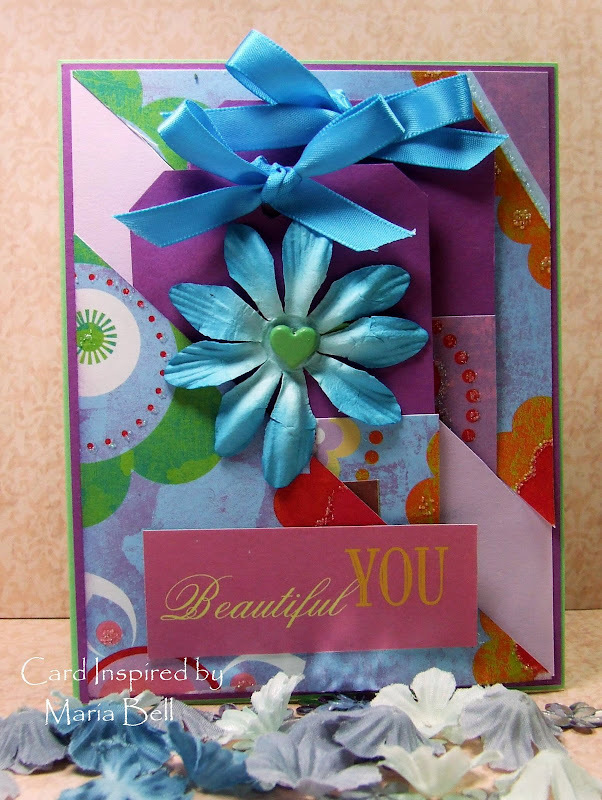 Anyway, check out the template if you want to recreate this flower card. The card fits into a 5.5 x 5.5" envelope. When printing the template, you may want to adjust the size by increasing the size on your printer program. Just to let you know. . .the designer paper is by TAC. Anyway, back to more card making! Until later, folks! Hi Everyone! I need to take a break. I'm in the middle of a big mess in my garage! I decided to start up the clean up process on Saturday and well, it's like a tornado went through my garage and threw everything all over the place. I guess before it can get clean, it needs to get ugly first and I mean, ugly. I've opened up every container and spread everything all over the place. Wow! It's scary. Yesterday I worked on the Christmas stuff and so far I've counted 12 containers, 4 of which are the huge containers. When we moved from Hawaii to California, we sold at least half of our Christmas stuff. . . so why do we still have so many Christmas stuff? It's NUTS! Anyway, I can't stand the garage looking the way it is. . .the faster I clean it up, the better I'll feel. I need to take a break this week to concentrate on the garage. Besides, my body ache so bad right now. . .I am in no mood to craft! I've used muscles I haven't used in years. I guess that's the price I have to pay for accumulating so much junk! When I'm completely done, I'll take a picture of the garage. Maybe if I'll even take a "before" picture. . . .we'll see. Hope y'all have a wonderful week!! Hey Everyone! How do you like my new banner? I think it looks better than my other one. I actually created the banner really quickly because I didn't want to fuss over it. It's like. ..sheesh, I have so many more other things I need to do. . .I can't be playing around with my banner. Besides, I have a problem choosing the "right paper", the "right font", the "right design". . .after a while. . .I told myself. . ."who cares!" LOL! 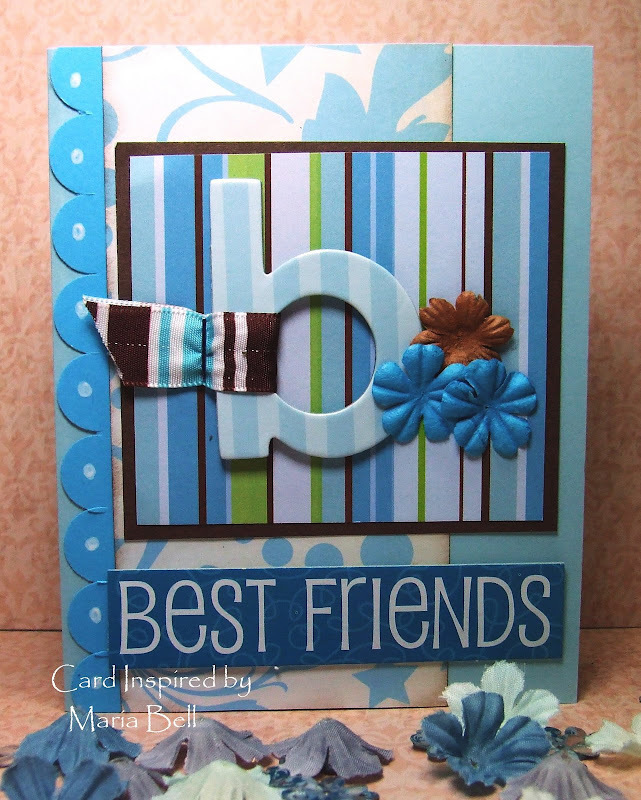 Okay. . .why is my post titled "crooked stitching card"? Well, I decided to "sew" the edge of my card and it looked perfectly fine when I was done but when I took a picture of it and looked at it, I noticed that the top right corner was crooked. It's funny because in person, I couldn't see that it was crooked. I guess because in picture, it sort of blows up every flaw on my card. I'm not ashamed of revealing all the flaws of my cards. It's a handmade card. . .there suppose to be tiny flaws. . .I think they add character to the cards. Yeah, right!! Are you kidding? I looked at the crooked stitch and I was like "darn it. . .it sticks out like a sore thumb"! But, honestly. . .you can't really tell that it's crooked in person. Anyway, so much for the card. . .
Gosh, I'm so happy it's Friday! I love Fridays! Friday is my favorite day! 2 more weeks and my kids' will be on summer break! Oh, I cannot wait! I have grand plans for the summer. Do you watch "Clean House"? Well, I was watching it the other day and the show inspired me. I decided to "purge" all my unused stuff. I mean seriously purge. Not the "sort of purge" kind of purging. I plan to eliminate everything in the garage that haven't been touched or looked at in the last 3 years. Every day, I will go through a container and pull out whatever I stored inside that I have not looked at in 3 years and drop them off at the Salvation Army. I want to move all my excess craft stuff into the garage and clear my craft room of clutter. That is my goal for the summer and I am so excited to start "decluttering". How about you? What are your grand plans for the summer" Anything exciting? Tell me about it! I would love to hear what your plans for the summer will be!! Have a happy, happy Friday, everyone!! Hi Everyone! Well, just a random card I made today. . .I saw a card in the Paper Crafts magazine and it was a very, very simple card but it looked really pretty. I decided to create a similar card but for some reason my card didn't look as pretty. Mine just looked simple. LOL! I decided to cut out a part of the scrapbook design and stick it on to the card but it still looked "blah" so I outlined the images on the scrapbook paper with a gel pen. Well, it didn't look very nice because it looked like "I" outlined them and not a very good job doing so. To "enhance" the outline, I added Stickles and finally, I liked how it turned out. It looked so much better with the glitter. So. . .in the end, I didn't end up with an "oh so simple card"! LOL! It just wasn't in the cards! Hi Everyone! 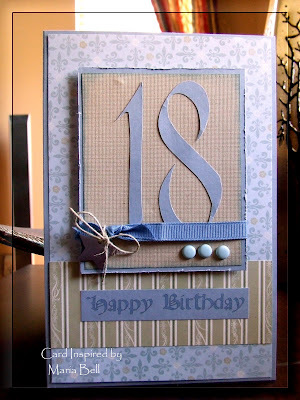 Today was my son's 18th birthday and I made this card for him. I wanted to make an "adult" card. Unfortunately, it sort of turned out a little too feminine for a masculine card. Using my Craft Robo, I cut the number out and glued on to the the textured panel. To create the sentiment, I printed it on my computer. While at the restaurant where we ate dinner to celebrate my son's birthday, I gave the card to him. I wrote a "words of wisdom" sort of note inside the card . . .sort of my advice and wish for him. Part of my "letter" to him was discussing the responsibilities that comes with becoming an adult and that choices that he make, even little ones, can sometimes have huge implications or consequences. Well, the irony is. . .he left the card in the restaurant. Last year on his birthday, he also left his dad's card at the restaurant and it actually had money inside of the envelope. My husband was obviously upset that he left it in the restaurant. Well, he did it again. . .luckily there was no money in it. He didn't even realize that he left it inside the restaurant until I asked him where he placed the card. Well, we went back to get the card and apparently, the bus person threw it away and they didn't know where it was. 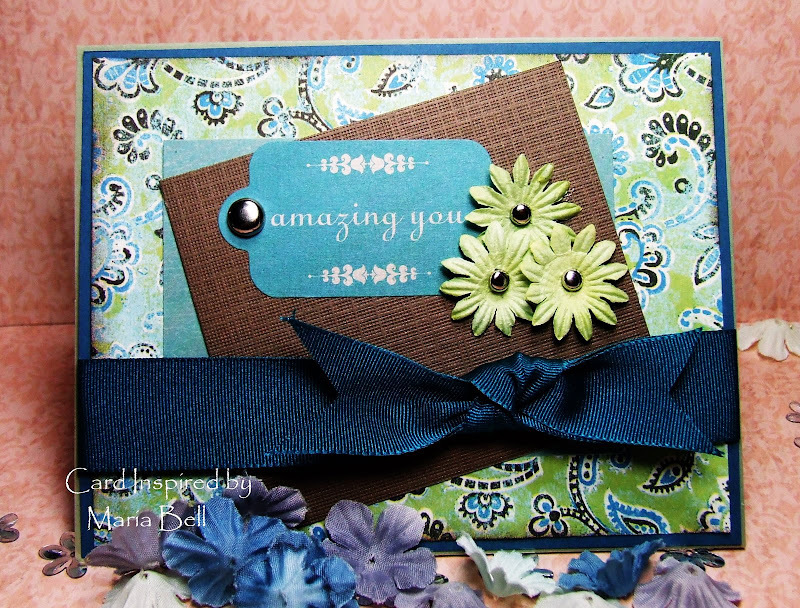 Anyway. . .back to the card. . .the cardstock is by Stampin Up - Bordering Blue and DCWV textured cardstock. The designer paper is by SU as well! Nothing much else to the card. Hi Everyone! I was working on a tutorial for my photo blog "Photo Inspirations" on how to stitch photos together on Photoshop. When I mean "stitch, I mean combine several photos together to create one photo. I found a basic tutorial and I created my own version of the tutorial. The tutorial I found did not have photos so I created to capture the pictures of each step of the process in my tutorial. Stop by my blog site "Photo Inspirations" for the tutorial. As you can see above, all the photos are one piece rather than 3 separate pieces of photos. When you print the photo, it'll print as one piece. Actually, this process is the same process that you use for Panaromic Photos. The process is really easy. If you don't have Photoshop, your program probably has a Panaroramic or stitch feature. . .my tutorial is on how to do this on Photoshop. Whenever I create scrapbook layouts, I use my printer program and print each photo individually then I'll arrange them together based on what I want my layout to look like. The problem is I found it cumbersome to cut and paste the photos together and I also wasted a lot of photo paper when I do this. Do you have that problem? Well, for the newbie scrapbookers or photographers, I'm sure you understand what I'm talking about. 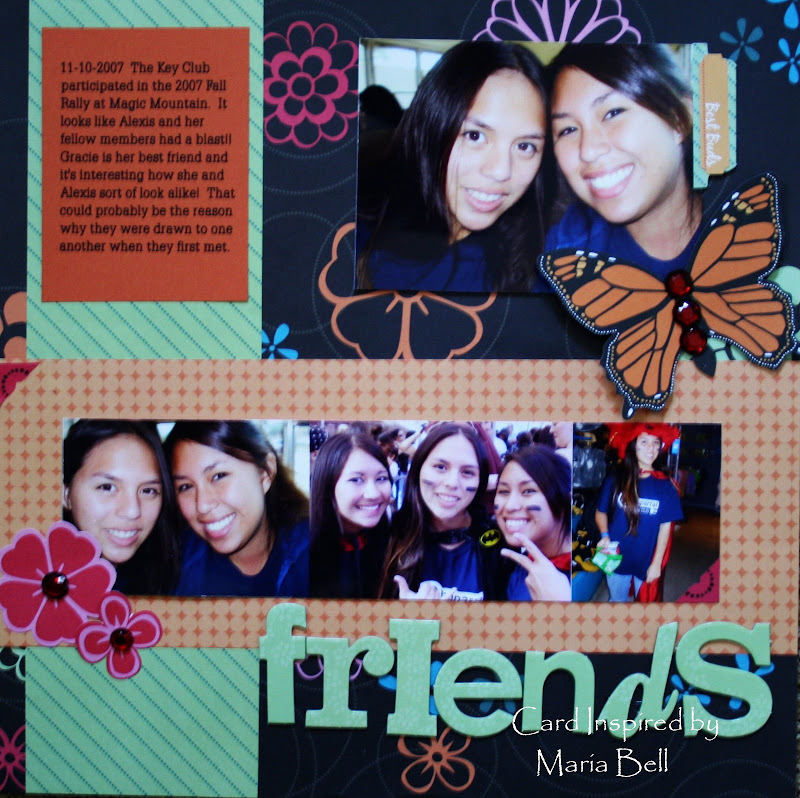 Anyway, my layout with the stitched photo was printed as one piece and it was easy to lay it out on my scrapbook page. The photos are of my daughter and her friends. They are part of the Key Club and they attended the Key Club Fall Rally to benefit the Children's Hospital. I don't know the exact name of the foundation that they were raising funds for. They had a blast and it's an event that the kids love to attend every year at Six Flags Magic Mountain.